Upon entering Rhode Island Martin had to pee. Rhode Island is not big enough to have any rest stops so I pulled over at a truck weigh station to let him go. He seemed very concerned about doing this and asked if I had somehow arranged to have all the cars on the highway to stop while he went to the bathroom. I did what any responsible parent would do and told him, "Of course I did." Arriving late they were able to have a late night Kindle session with Grandpa before getting to bed around midnight. The next morning Nana had a blast hanging out with the kids after breakfast and we got ready to see family and friends for the day. Josie hit it off with cousin Kolbie. Nolan showed Elliott the proper way to dig up Aunt Pauline's yard. And they also got to meet their cousin Alice. The next morning we traveled south and got to spend a day at the beach with what may have been the best beach weather in my entire beach-going life. Josie was immediately worn out by the experience and slept comfortably in the tent that Jeff and Liza had set up on the beach. We got to bury the boys in the sand to a level we aren't really able to achieve at the man made beaches back home. After the beach there was even more swimming. Josie got to swim with a float and the boys got to use swim arms for the first time, something that worked better than I could have anticipated and that they loved more than I would have ever imagined. The boys were also able to sit with the ten-year-olds and be extremely silly while the rest of us ate delicious chowder, burgers, and hot dogs. 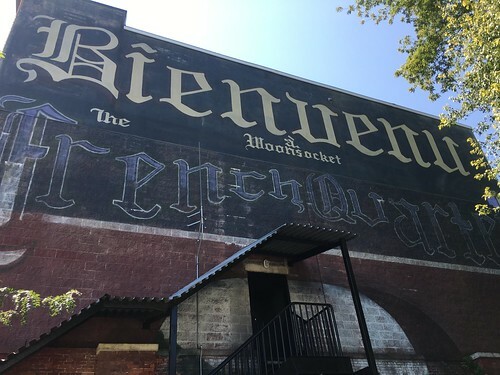 The following morning we headed into downtown Woonsocket where I got to do something I've been threatening to do for a long time: take Jen out for New York System Wieners. 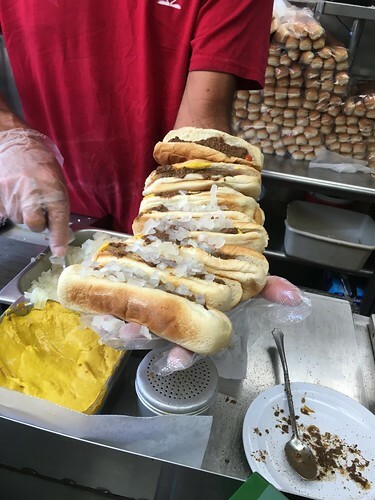 New York System Wieners are a food that you can't get outside of Northern Rhode Island, surprisingly not even in New York. We had a modest two a piece for lunch which scratched an itch I've had for a long time. I don't think Jen's appetite was as satisfied as mine was but it certainly ended a curiosity she's had for some time. Aunt Sim and Cousin Natalie came over to spend some time with the kids. I found a Del's truck in a mall parking lot and was able to also give the boys their first taste of the famous Rhode Island frozen lemonade. Sadly, they were not accompanied by the traditional pretzel rods. 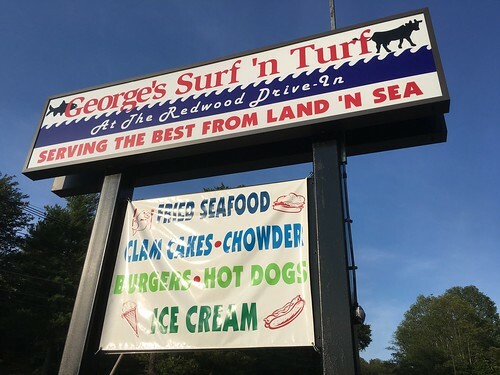 We also took a trip to George's Surf 'n Turf. We still call it The Redwood, which is the name the place had like thirty years ago. 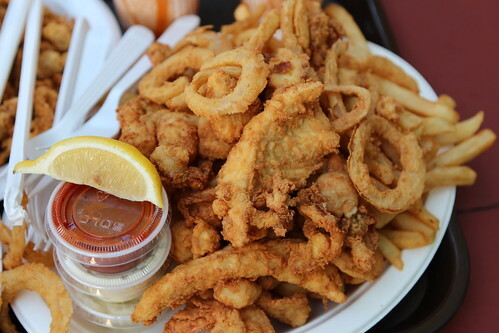 The $24 fried seafood platter was a huge hit. 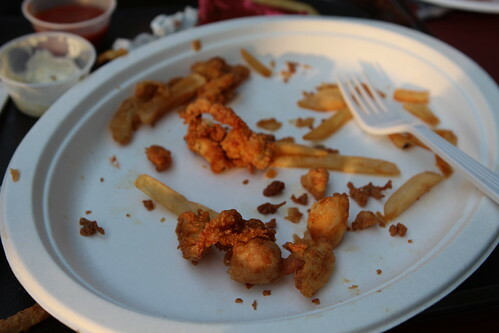 Elliott ate 90% of the shrimp, Josie ate 95% of the scallops, and we split the rest of it. Overall it's a tremendous deal to feed a family of five. I'm not discounting the kids because they're small, the three of them easily eat similar portions to their parents. Josie is a shellfish eating powerhouse. After dinner we got ice cream and for some reason there was a limit on kids' cones so they all got the small adult portion which was an ice cream cone about five times the size I normally make at home. Josephine was up to the challenge. We coincidentally ran into some family friends we'd already seen on the trip and were able to take this picture with all the kids together. This picture was taken after ten minutes of wrangling during a 10 second window when we were all together. 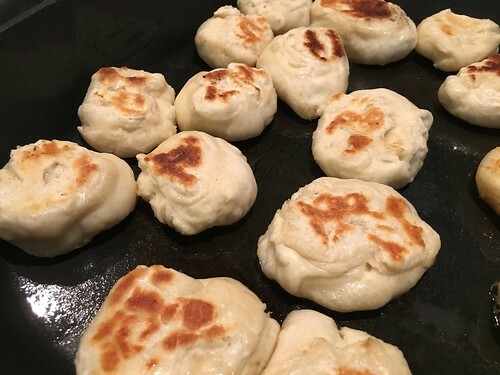 The morning before we left for Montreal we got together at Aunt Pauline's for little breads, a traditionally Woonsocket breakfast which is merely some little balls of dough that are cooked in a skillet. That being said, they are delicious, yet I've never had them outside of that kitchen anywhere in my life. I wonder if they would even taste the same cooked elsewhere. After that it was back on the road and headed to Montreal. What adventures would await us when (and if) we crossed the border? You'll have to wait to find out.